Kay Hagan: Opposed offshore drilling until August compromise. Elizabeth Dole: Release 1/3 of the nation�s strategic petroleum reserve. Kay Hagan: No tax breaks for big oil companies that give us $4 gas. Kay Hagan: Washington experience means putting special interests first. Elizabeth Dole: Help sheriffs identify illegal immigrants among suspects. Kay Hagan: ID�ing illegal immigrants is an unfunded federal mandate. Elizabeth Dole: Crackdown on illegal immigrants who commit crimes. Kay Hagan: Supports increased border security and opposes amnesty. Elizabeth Dole: Link local sheriffs to federal immigration tools. Kay Hagan: Deportation program is an unfunded federal mandate. Kay Hagan: Lack of immigration system is why we have unsecured border. Elizabeth Dole: Has spent time in all 100 counties while Senator. Kay Hagan: North Carolina needs a work horse, not a show horse. Elizabeth Dole: Broad experience in Washington & major-league clout. Elizabeth Dole: Sales tax, income tax, food tax, liquor tax: it�s too much. Elizabeth Dole: Precipitous Iraq withdrawal leads to further instability. Kay Hagan: End the war in Iraq with a diplomatic surge. Elizabeth Dole: Mistakes were made, but no precipitous withdrawal from Iraq. Kay Hagan: The Iraq war had not made the U.S. safer. 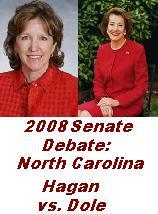 The above quotations are from 2008 North Carolina Senate Debate between Elizabeth Dole and Kay Hagan.